Here is mine. The frame is a little different, I used grapevine wrapped wire instead of dowels (although I am going to work on one with the dowels too). I free-handed the postage marks, but you could print some off and put it behind the burlap and hold it up to a window to trace it. I used the same curtain clips I used on my Christmas stockings. PS--My bulletin board cost about $7--$1 for the bulletin board, $2 for the frame, $1.50 worth of burlap, $2 for curtain clips. Hi! I'm stopping over form Homebody. Your BB looks awesome! I actually like the wire (and cliprings! So cool!) better than PB's dowel. Great job! This was on my short list of knock-off possibilities. Love how yours turned out...I can't believe you free-handed the postage mark! It looks great! I like the wire better than the dowel rods! Love this! Love this... fabulous job... liking your version much better and I certainly am liking your price much better. Great job. Great job!! This was on my list until I decided to redo my ladder and make it into a bulletin board. I'm posting that tomorrow. I prefer yours to the PB one. Excellent! Oh my goodness! I love this! You did an excellent job. Your version is fabulous. I like the wire. Wow! I LOVE your version! The black frame of it looks fantastic! Beautiful job on the free-handed postage marks! The curtain clips are perfect too! Great job! I am in love!! Awesome job!! I like this a lot. It's amazing, once you start crafting, you begin to see projects everywhere, huh??? Thank you Pottery Barn for inspiring people and giving me lots of fun tutes to follow! I'm stopping by from A Soft Place to Land. 7 bucks??! I love your version...especially the curtain clips. I love your version! The black really makes it look fantastic. So very creative! Awesome! I have been eyeing that bulletin board too but not loving that $199 price. Your's is a-ma-zing! I'm loving your version better than its PB sister. PB should beware! Yours is much, MUCH nicer - and I really mean that. It inspires me to do something new and different with all the old windows we salvaged. Great job! Love it! A little ingenuity saved you nearly $200. That's amazing! I love yours much better and of course the price is so much better!! Good job! your creation is seriously stunning! just lovely! Bravo! I like the wire better too. It looks FABULOUS! I was too chicken to draw the postmarks but yours look great. I love the idea of the wire and the clip hooks, and the chunkier frame is great. Well done! Great job! I have a very long list of projects but I just have so many other things going on I haven't had a chance to do anything. Very inspired by your PB knock off. I need to get busy. I really like this idea. Great job on the free hand work too! Great make...love it and it is so prim. I LOVE it!! You did a knock out job!! The Grapevine wire adds a lot of interest to this piece! Good thinking!! Just fabulous. I love your version, especially the black frame, so cool! Thanks for linking up! brilliant and much more affordable! love all your creative ideas! That is so stinkin awesome! I like yours better...no contest! I love it! I have a few PB knock off ideas floating around in my head...now to get to it and tackle them! You did GREAT. I would love to have you post this to my Its So Very Creative party on Mondays-My parties are open all week long so you can either post it this week or wait till Sunday night when I post it for next week. I have also started a Thursday Tute and would love to schedule you to do a tutorial some time. I signed up to follow you and yes you are correct the button is to the old site. Goggle messed up my blogger account so many times I just had to move even before I had everything done so I am working like crazy to get everything done. I love it....your version is my fave! Will you make me one? I LOVE this and was thinking of making one for my kitchen...now if only I could find just as good of a deal on a frame and bulletin board. Fabulous my dear...any girl who can whip out a can on PB is after my heart. Hi, Becky! Just wanted to let you know that I was totally inspired by your project and made my own version. I hope you don't mind- I linked to your project in my post. I'm sorry, but $199? Are they nuts? Yours is much better in my opinion. 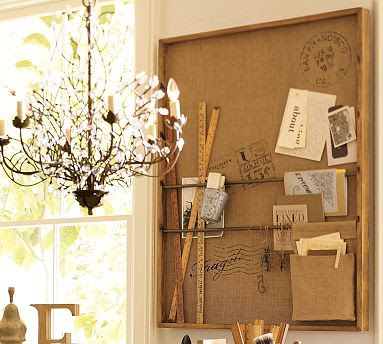 I love how you distressed the frame black and used curtain hooks. Fabulous! Shame on them! And you go girl!! I like your frame better, and the curtain hooks, too! Candle Holder or Something Else?